Russian president Vladimir Putin, after winning the popular vote of the Russian people and retaining his presidency in 2012, has declared that he and his administration have identified and removed from all positions of power those men and women who were agents of the New World Order agenda to bring Russia down from the inside by collapsing the economical, political and social structure of his country. In Putin's victory speech to the Russian people (see video below), Putin praises the Russian people who, he says, recognized the impostors who were attempting to bring Russia down while pretending to love their country. At this time, the NWO middle management teams who act under the orders of the ruling oligarchs of our world are attempting to destroy from within the United States. This is their mission at this time. Some of you may have learned recently that some of the top globalists have stated that their plans for a New World Order are running up against strong opposition by the people due to the sharing of information throughout the internet and the subsequent awakening of the masses. US President Obama has already declared he will snub the opening ceremonies of the Winter Olympic Games at Sochi, Russia, on February 7th, the first time in modern history a US president or vice president will not attend an opening ceremony at an Olympic Games. What will happen in days to come for Russia remains to be seen. Their fight is not over by any means as there will likely be opposition to their sovereignty. Will the people of the US be manipulated again into supporting yet another war? Here in the United States, the New World Order agenda pushes on. The plan of the globalists is to destroy the United States from within through a collapsing of our financial system while simultaneously causing civil unrest in the streets and ecological disasters throughout our country. Will our nation survive these attacks? Will the American people awaken in time and see what is being done to their beloved homeland and preserve the dream conceived by our founding fathers almost 3 centuries ago? Gregg Giles!!!!!!!!! Where did he suddenly spring up from? Thought he was long gone. I thought this was great news until I got to the bottom and saw his name, DAMN. Rev. Joshua, don't hold your breath waiting for a response from Greg. He doesn't respond when he gets caught in a lie. He's already working on the blog/lie he can make up. That's just the way he operates. Great video, Acute Observer! Sea Walls...LOL, hahaha!! That brings back memories! So many people fell for that one. Remember when he said they beamed up US Treasury Secretary Timothy Geithner, then he showed up 4 days later on tv? Greg's excuse...some other people in the federation got hold of the equipment that sends him messages and sent him wrong messages. They kicked them out of the federation for that. 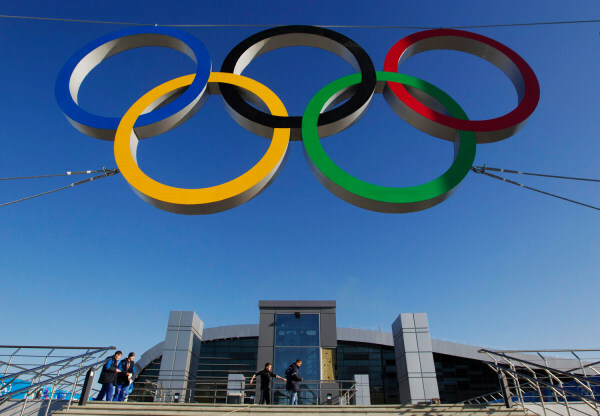 The Olympic rings are on display in front of a newly-built railway station "Adler" in the Black Sea resort city of Sochi, Dec. 24, 2013. MOSCOW -- The organizing committee for Russia’s Sochi 2014 Winter Olympics said Thursday it was "not really concerned" that President Barack Obama would not be attending the event. Sochi will be the first games since 2000 not attended by a U.S. president, first lady, or vice president. Obama said his decision not to go was due to a busy schedule in Washington, but it has come against a backdrop of increased tensions with Moscow. Asked if Obama's decision to stay away was a concern, Head of Russian Olympic Committee Alexander Zhukov told NBC News: "The Olympic Games are the competition of outstanding sportsmen and this is the main reason why they are interesting. "It's not a summit, which only the country leaders attend. So we’re not really concerned about it." The U.S. and Russia have clashed over several issues in recent months, including the Syrian civil war and Moscow’s decision to grant asylum to National Security Agency leaker Edward Snowden. But it is Russia banning"homosexual propaganda" that has prompted many Western celebrities and rights groups to call for a boycott of the Sochi Games. The Russian Olympic committee unveils the various different uniforms for the 2014 Sochi games. In an August interview, Obama said he had "no patience for countries that try to treat gays or lesbians or transgender persons in ways that intimidate them or are harmful to them." French President Francois Hollande and German President Joachim Gauck are also staying away from the games. And European Union Commissioner Viviane Reding said: "I will certainly not go to Sochi as long as minorities are treated the way they are under the current Russian legislation," Reuters reported. The U.S. delegation to the games contains openly gay athletes, including figure skater Brian Boitano, tennis legend Billie Jean King and ice hockey player Caitlin Cahow -- a move Obama said shows that the U.S. does not make distinctions on the basis of sexual orientation. To this, Zhukov said: "Who the members of the delegation are, is the business of the country that sends them [to the Olympics]. "The Americans or the Germans include people who they think are necessary [for their delegations]. I guess this is how they see the faces of their country." He added that the games were "incompatible with politics." "I can say that we expect sportsmen from all over the world and I have never heard any serious statements about the boycott from any politicians or the members of the Olympic Committee," he said. Many have interpreted Russia's pardoning of former oil tycoon Mikhail Khodorkovsky, the remaining members of punk band P**** Riot, and expected release of 30 Greenpeace activists detained since September as an attempt to soothe criticism in the run-up to the Sochi Games. Luke Skywalker is right! Listen, or actually, read, what Putin is saying. There's nothing there that says anything about defeating the NWO in Russia. This is his re-election speech! It even says so in the beginning of the video! Hey, Rev, did you even listen to the video or did you just posted this because it says Putin defeats NWO without reviewing it first? Anything that has the name "Greg Giles" in it, stay far away as possible and hit the delete button. Just another way to attract followers to his site by making up lies. A Greg Giles tactic that doesn't work anymore. I keep hearing about a new financial system underway and yet I dont see squat ..
We need a new financial system in the U.S.A. There is no point in using the scam we call our current financial system. We need to move to a fair/lawful system not designed by corrupt/greedy bankers. This post smells a little fishy to me. It's not like Giles has a good track record for selling Truth... but who knows these days... so many fakes out there it's hard to tell who is legit.